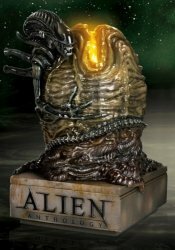 The ALIEN ANTHOLOGY is a truly unique home entertainment experience. For the first time ever, the material has been united from every home video release of the ALIEN saga including the 1991/1992 laserdisc releases, the 1999 "Legacy" release and 2003's groundbreaking ALIEN QUADRILOGY release into one complete Blu-ray collection. The set also includes two versions of each film and over four hours of previously unreleased exclusive material such as original screentests of Sigourney Weaver prior to filming the original ALIEN, , unseen deleted scenes, thousands of still photographs from the Fox archives, the previously unseen original cut of "Wreckage and Rage: The Making of ALIEN3," and much, much more. In addition to over 12 hours of candid, in-depth documentaries, you now have the ability to go even deeper into Alien Anthology history with nearly five hours of additional video Enhancement Pods created exclusively for this collection, presenting behind-the-scenes footage, raw dailies and interview outtakes from all four films. At topical points in the documentaries, you may access these pods to enhance your experience, or watch them on their own from the separate Enhancement Pod index.